It's hard to find high-quality dividend stocks worth adding to portfolios, but these companies could be the exception. If you're looking for high-quality companies that return money to investors via shareholder-friendly dividends, then Amgen Inc. (NASDAQ:AMGN), Store Capital Corp. (NYSE:STOR), and Las Vegas Sands (NYSE:LVS) ought to be on your list. Our Motley Fool contributors think their market-beating dividend yields, financial strength, and potential for dividend increases make them perfect to consider owning in income portfolios. Read on to find out if these stocks are right for you. Maxx Chatsko (Amgen): Most biopharma companies don't pay a dividend, but Amgen is not like most biopharma companies. The $125 billion Goliath is an industry leader with some of the top-selling drugs in the world. It certainly shows: The business reported nearly $29.4 billion in cash at the end of the second quarter of 2018. That provides plenty of opportunities to create value for shareholders, whether through acquisitions, share buybacks, or the steadily growing 2.6% dividend yield. That said, investors might expect the next few years to be relatively quiet. Industry valuations are historically high, which will likely put a damper on acquisition opportunities. Meanwhile, some of the more promising pipeline assets are in early and midstage development, although those include potential breakthroughs such as next-generation T-cell immunotherapies. Although there are risks from patent expirations that should not be overlooked, Amgen's cash flow should remain strong thanks to recent cost reductions and new drug approvals like Aimovig for migraines and Parsabiv for dialysis patients. The looming threat of increased generic competition should also force the company to prioritize research and development investments to protect its mid- and long-term future. Either way, there's an interesting opportunity emerging for investors if biopharma stocks continue to slide through the end of the year as the broader stock market cools down. Not only would Amgen stock become more attractive thanks to lower valuation metrics, but smaller biopharma companies would also be more attractive for acquisitions -- potentially allowing the industry leader to quickly deploy some of its $29.4 billion in cash. Opportunistic investors will want to keep an eye on the situation. Todd Campbell (Store Capital): With Sears' bankruptcy dominating the news, you might think owning any real estate investment trust (REIT) that makes its money from leasing to retailers is bad business. That's not necessarily the case. Yes, big mall operators are under pressure because of e-commerce. But many retail businesses are insulated from online shopping -- and those businesses are Store Capital's target market. Store Capital leases over 2,100 freestanding retail locations to more than 400 tenants in over 100 industries. It protects itself from being blindsided by vacancies by acquiring properties below their replacement cost, vetting tenants carefully on a per-unit basis, and then signing middle-market-sized tenants that are at less risk of being disrupted by e-commerce -- like gyms, movie theaters, furniture stores, restaurants, and early childhood education providers. Since going public in 2014, its adjusted funds from operations have grown by an average of 7.2% annually, and that has allowed it to increase its annual dividend by an average of 6.6% per year. Despite the increases, its dividend payout ratio is only 70%, which suggests plenty of room for future increases, particularly since the company includes annual rent increases in its contracts. Still unconvinced? Then consider this: Investing in Store Capital to pocket its 4.4% dividend yield puts you in good company. Warren Buffett's Berkshire Hathaway (NYSE:BRK-A)(NYSE:BRK-B) is so enamored with Store Capital's business that it owns almost 10% of it. Travis Hoium (Las Vegas Sands): The gaming industry has long been a high-risk investment because of the massive cost of building casinos and the leverage that companies usually take on to expand. But over the past decade, the industry has de-leveraged, and some companies are generating so much cash that they are returning it to shareholders in dividends. One of the leading dividend payers is Las Vegas Sands, owner of casinos in Las Vegas, Macau, and Singapore. 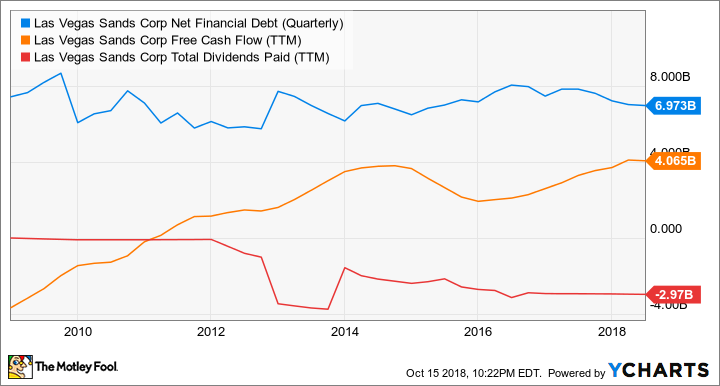 You can see below that Las Vegas Sands has increased free cash flow to about $4 billion per year and been able to maintain net debt of around $7 billion over the past decade. All the while, it built the $4 billion Sands Cotai Central, which opened in 2012, and the $2.7 billion Parisian, which opened in 2016, both in Macau. Plus, it started paying a sizable dividend. LVS net financial debt (quarterly) data by YCharts. The beauty of the gaming industry is that most of the cost associated is up front in the construction phase. Once the casino is built, it's a cash cow. Las Vegas Sands has spent two decades building casinos, and now it's just collecting cash from those projects. There aren't any major projects on its horizon, either, so this 5.3% dividend yield looks safe for the foreseeable future with the proceeds from some of the most successful casinos in the world.